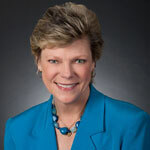 Cokie Roberts, a political commentator for ABC News, will deliver the commencement address at both campuswide ceremonies at the University of Illinois on May 13 at Assembly Hall. The ceremonies take place at 10:30 a.m. and 2 p.m.
Roberts, who provides analysis for all network news programming, co-anchored “This Week” from 1996-2002 with Sam Donaldson. She also serves as senior news analyst for National Public Radio. In her more than 40 years in broadcasting, she has won numerous awards, including three Emmys. She is a member of the Broadcasting and Cable Hall of Fame, and was cited by American Women in Radio and Television as one of the 50 greatest women in the history of broadcasting. Roberts and her husband, Steven V. Roberts, write a weekly column syndicated in newspapers around the country by United Media. The Robertses also are contributing editors to USA Weekend Magazine. Their co-written book “Our Haggadah: Uniting Traditions for Interfaith Families” was published in 2011. Their earlier collaboration, “From This Day Forward,”an account of their more than 40-year marriage and other marriages in American history, was a New York Times best-selling book. All of Cokie Roberts’ other books have been best-sellers, including a No. 1 best-seller, “We Are Our Mothers’ Daughters,” an account of women’s roles and relationships throughout American history. Her other books – “Founding Mothers,” published in 2004, and “Ladies of Liberty,” 2008 – are histories of women in America’s founding era. Roberts holds more than 25 honorary degrees and serves on the boards of several non-profit institutions. In 2008 the Library of Congress named her a “Living Legend,” one of few Americans to have attained that honor. She is the mother of two and grandmother of six.